The Staff in the Office of Career Planning is happy to meet with you. Don’t want to make an appointment and would rather just walk-In or send an email? Meet with a Career Ambassador Peer Advisor to have your resume, cover letter or personal statement reviewed. They can also help you with Handshake and answer general career advice questions. Career Ambassadors are available in-person during Walk-in Hours or can provide an electronic review via email. 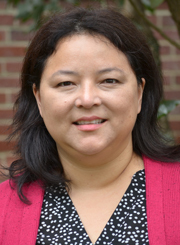 Mary Ellen Liseno is an online lecturer in the summer and you may come across her in classroom presentations or delivering evening workshops. Prior to working in the field of career services, which she began in 2003, she enjoyed building relationships with students as a residence hall director at various universities, which stemmed from her own experience of being a resident assistant when she was an undergrad. Outside of higher education, Mary Ellen’s passion is travelling and working internationally. Her first foray outside of the country was at age 17, and to date she has visited 44 countries. After college (not knowing what she wanted to do with her communication’s degree), she obtained a work visa and found a job in London, England selling T-shirts at the Hard Rock Café. She later went on to spend 3 months walking across France into Spain, being a tour leader across the U.S., sailing with Semester at Sea, being a rural health Peace Corps volunteer in Paraguay, and most recently a higher education consultant for USAID/World Learning career services project in El Salvador. Mary Ellen embraces stepping outside of her comfort zone, and encourages students to do the same, whatever that might be for each individual. Her messages to students are many, but above all, you will often hear her say: “Your next steps are the right next steps for you." 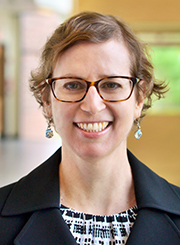 Erin has eight years of experience working in higher education, including career services roles at both Amherst College and Springfield Technical Community College. Prior to that, she spent time working in IT consulting and in property management – so she understands the sometimes-winding nature of a career path! She earned her Bachelor of Arts degree from Miami University (Ohio) and a Master of Liberal Arts degree from Harvard University, both in psychology. After growing up in the Midwest, Erin spent four years living in Boston before settling in western Massachusetts. In her free time, she loves exploring the Pioneer Valley, watching football, spending time with her family, and curling up with a good book – new recommendations always welcome. She is excited to join UMass Amherst and the SPHHS community. Aimee works to create and manage partnerships between SPHHS and employers in the field of public health. Her goal is to place students in challenging positions that are compatible with their academic background and professional goals. She facilitates opportunities for students to gain exposure through semester-long and summer internships for academic credit, as well as to pursue permanent positions through these partnerships. Prior to joining SPHHS, Aimee worked for many years in international humanitarian aid and development. Early in her career, she served as the Director of Programs for AmeriCares, where she managed medical / public health partnerships with diverse health systems such as in Haiti, Uzbekistan and North Korea. More recently, she explored the private sector through analytical work with Alt Terrain, a Boston-based experiential marketing company. Aimee is dedicated to helping students at SPHHS achieve their goals, so they should feel open to exploring connections and resources with her. Outside of the school, Aimee enjoys travelling, historical drama, and studying new languages and cultures. She is also a self-described sports and arts mom, who spends a lot of “free” time with her family at hockey games, meets, and recitals throughout New England. To schedule career-advising appointments, log in to Handshake with your UMass net ID and password.